Floyd Mayweather Jr. arrived at the MGM Grand on Tuesday, April 27, 2010, in Las Vegas. 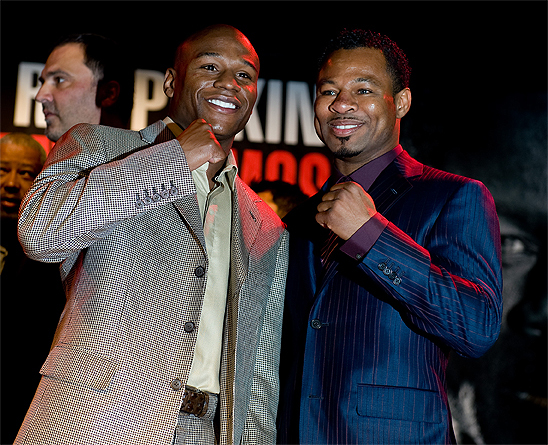 Mayweather is scheduled to face Sugar Shane Mosley on Saturday. Although Mayweather is the projected favorite, the over/under for the fight was recently set at 11.5 rounds suggesting most fans believe this bout will go the distance. Mayweather currently holds a perfect 40-0 record with 25 knockouts while Mosley boasts a 46-5-0 record with 39 knockouts. Clearly the match between the two is a battle of the boxing titans. Although the battle is between two champion boxers, there is still uncertainty whether or not Mayweather will be fighting for Mosley’s WBA welterweight boxing title. For now, it seems as though the belt will not be on the line. However, Golden Boy Promotions continues to pursuade the WBA to put the belt on the line for Mosley, who believes owning the belt is important and the valued prize of the fight. Mayweather suggested that he does not care about the title belt because he believes that he has already proven himself to be the best fighter, doing undefeated throughout his career, and that this fight is simply about improving his legacy and making money. Mosley challenges the ideology that Mayweather is the best fighter by suggesting that Floyd hasn’t always faced the best opponents that he could have. He believes that Saturday will be a true test of Mayweather’s capabilities as a boxer and that the title should be on the line for the true champion of the sport to walk away with. We’ll take a look at updates this week and tune in Saturday to see how the story unfolds. Manny Pacquiao dominated Joshua Clottey in front of 50,994 at Cowboys Stadium in Texas. The new Cowboys stadium is earning a lot of popularity as being a great sports venue. While football fans are amazed at the gigantic mega television that stretches nearly the entire length of the football field, others are amazed at the fact that there really isn’t a bad seat in the house, including the standing room in front of the huge wall of glass windows. On March 13th, nearly 51,000 fans loved their seats as they witness Pacquiao prove once again, why he’s the best in the boxing. Earlier in the year there were talks of Pacquiao fighting the infamous, flashy Floyd Mayweather Jr. That fight got put on hold due to contract disputes. However, Pacquiao agreed to the fight with Clottey. Later this year, Mayweather Jr. will fight Mosley. The next logical step is to have Pacquiao fight the winner of the bout between Mayweather and Mosley. Mayweather wants Pacquiao to take a drug test. There are also differences between who will promote the fight. If all that can be sorted out, we should be geared up for one of the biggest fights in boxing history. Before we get to that, we’ll look forward to Mayweather/Mosley in a truly eventful day which boasts the Kentucky Derby earlier in the afternoon. ARLINGTON, Texas – Joshua Clottey may have been bigger, but that was his only edge on Saturday night. Manny Pacquiao clearly outworked Clottey, outpunching him four, five and even six to one at times in winning a wide decision before a standing room-only crowd of 50,994 at Cowboys Stadium. Pacquiao punished Clottey with combinations to the body throughout in winning the unanimous decision to retain his World Boxing Organization welterweight title and his status as the world’s finest boxer. It was no contest as Clottey simply kept his guard high and rarely threw punches. According to CompuBox, Pacquiao landed 246 of 1,231 punches; Clottey connected on just 108 of 399. Pacquiao took advantage by using his blazing hand speed to rip through Clottey’s gloves and land hard, punishing shots. He made the former champion wince several times as he fired off hard combinations at Clottey’s midsection. Despite the exhortations in the corner of trainer Lenny DeJesus, Clottey never opened up and fought aggressively. He was backed up all night and, except for an occasional shot, never did much to Pacquiao. It was another virtuoso performance for the Filipino superstar who has won titles or has claimed the linear championship in seven different weight classes. Pacquiao is on a collision course with unbeaten rival Floyd Mayweather Jr., who fights Shane Mosley on May 1.